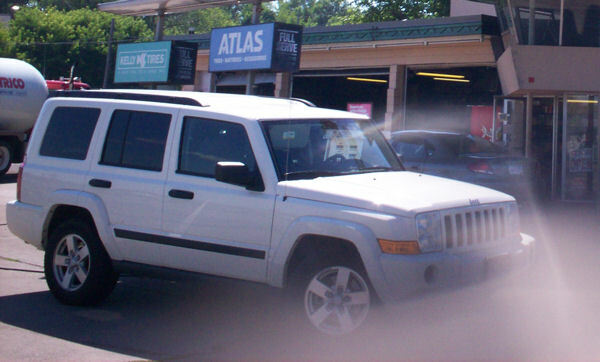 Our 2006 Road Trip, Part 1: Our Milkman’s Chariot Awaits « Midlife Crisis Crossover! [Welcome to the first installment of a very special miniseries, representing the original travelogue from our family’s 2006 vacation to scenic Wisconsin and Minnesota, home of much forestry, many lakes, and very odd things. Some hindsight editing and modern-day commentary will be included along the way as value-added bonus features for readers old and new alike. All photos were taken with one of two cameras: one Kodak EasyShare that was obsolete when we bought it, and one 35mm camera whose film had to be dropped off for developing and whose pics were scanned using an equally obsolete, poor-res scanner. Very little about these entries will approach 1080p quality. Back in our day, this is what history looked like. When these travelogues were written, they were as much about the writing as they were about the pics. Consequently, some entries will have one photo, while others will have several. I’m adding some present-day commentary in spots as value-added epilogues. I’ll also be inserting several photos that we’ve never shared publicly before. Even our internet friends who read the original entries will be seeing previously unreleased material for the first time. As with last year’s vacation, rather than submit either of our own cars to hundreds of miles of wear and tear, we rented an SUV for the extra space, comfort, and intimidation factor — what better way to announce to the townsfolk of other locales, “Back off, man! We’re TOURISTS!” Granted, we had to prepare ourselves to spend extra money on gas, but that falls in line with my own little personal plan to help save America: the way I figure it, if every one of us works together to use up all the gas in the world as quickly as possible, down to the very last drop, then we’ll be forced to make the transition to alternative fuel sources that much sooner. Avis Rental unknowingly aided me in that goal by lending us an even bigger gashog this time. The Hyundai Santa Fe we used for our 2005 road trip to San Antonio averaged 20 mpg. On our one-day trip to Metropolis, IL, this past June, we drove a Ford Escape that approached an astounding 24 mpg. Contrast that with this trip’s assigned model, a white Jeep Commander that, at an average of less than 18 mpg, was a mobile money pit. Part of this was attributable to a problem we didn’t fully reckon with till we were hundreds of miles from home. By a unanimous vote, the Commander was also declared the ugliest car we’ve ever rented. It looked like an armored milk truck. Every time we left a given place and searched for the Commander in the parking lot, we’d invariably walk to a much more stylish white SUV or more aerodynamically sound white kidnapper van…then shrug off our wishful thinking as we reminded ourselves that our ride was the shiny eyesore a few spaces down. 1. Ever since a 2004 long story involving a busted alternator and the city of Cleveland, we’ve rented cars for our vacations ever since. From our 2007 vacation onward, the ritual Locating of the Driver’s Manual ritual became a key step in every rental experience. We don’t hit the road without knowing where it is, precisely because of 2006. 2. 2006 was the year before we became homeowners, when we were living in a cramped apartment with our combined collections still vying for space two years after our wedding. My son was 11 going on 12, and he and my wife were still working through the stepmom/stepson dynamic. Interesting, awkward, occasionally emo times.